I wove this shawl for my forever chilly daughter. I dressed the loom Monday and wove it yesterday. The wool is 2/4 Highland Tweed, Starry Night. 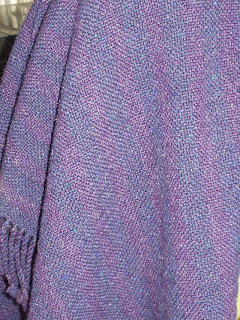 The other wool is unknown, but is a deep violet. I warped alternating the blue and violet yarn and wove stripes 1" wide, again alternating the two colors. 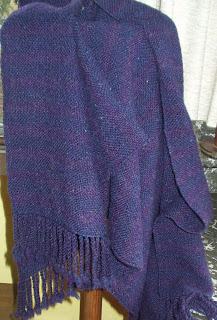 The shawl was 25" in the reed, set at 8epi and woven plain weave for 72". I left 6" at each end for fringe. Final dimensions 20.5" x 67". Fringe is around 4.25". After twisting the fringe I filled up the washer with warm water and a dash of detergent. I allowed it to agitate on gentle for a few minutes then let it soak because something good was on TV and I forgot about it. I think it soaked about 30 minutes longer than I would ordinarily let it soak. I spun out the water, removed the shawl and filled up the washer again with warm water for the rinse. It agitated only about 2 minutes (heart palpitation time)and set the washer to spin. I filled the washer a final time and added a healthy glug (1C?) of vinegar to the water. I emptied the dishwasher and came back and spun the shawl for the final time. I threw it into the dryer set on "air" and let it flop around for a few minutes. I read somewhere that this will eliminate any creases caused from spinning the fabric in the washer. I put it on the washer to dry overnight. I'll hard press it today, or eventually. The blankets have yet to be pressed. Absolutely beautiful, Marie. And thanks so much for putting all the details in. This is helpful to us newbies who use you experienced folks as mentors/teachers! ps - I have the warp on the loom and tonite I start weaving my version of your placemats! Woman, you are a machine! I really like the shawl. I think alternating the warp was a great idea.